Bloom FX is a bloom booster. It is designed to give you larger, fuller and denser flowers. Bloom FX will also increase the potency of your flowers by increasing their essential oils. It stimulates explosive growth and heavier blooms. Bloom FX can be used in both soil and hydroponic systems. Hydroponics - Use 15 mL per gallon in your reservoir. Soil/Coco/Other medium - Use 15 mL per gallon everytime you water. Discard any unused mixed nutrients. Hydroponics - Refer to the feeding schedule for week by week amounts to use. Pour directly into your reservoir. Soil/Coco/Other medium - Refer to the feeding schedule for week by week usage amounts. Use it everytime you water. Discard any unused mixed nutrients. Notes: Never premix with another product, always add directly to the reservoir. Adjust your pH after adding all your products. It is the moment you have been working for, waiting for, dreaming of…Your babies have started flowering and now it is time to take production to the next level. You have been feeding with the Bloom and Micro Nutrients and your garden is bursting with beautiful colors and aroma. No doubt, you can’t help but feel a sense of pride. After all, these are the fruits of your labor, and we all love BIG fruit. If you are looking for larger, thicker, denser blooms, Bloom FX is the product you want to use. Bloom FX is an effective and affordable bloom booster. It is designed to stimulate plants to produce larger, thicker, denser fruits and flowers. In addition to increasing your garden’s yield, by adding Bloom FX to your plants, you are also increasing their essential oil production and potency. Bloom FX can be used in all mediums, including soil, hydro, coco, and soilless mixtures. Larger: Plants that eat more, grow more. Nutrients with higher quality ingredients are more easily digested by plants, and therefore grow faster, healthier, and larger. Starting with top shelf pharmaceutical and technical grade ingredients makes Bloom FX the booster of choice for achieving larger fruit and flowers. 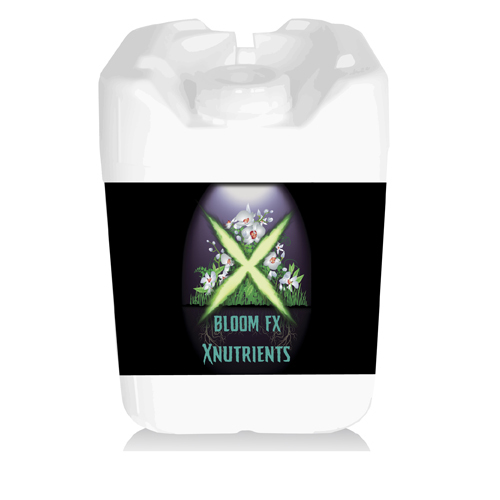 Bloom FX contains ingredients that signal the plant to divert all of its energy towards blooming. Bigger: Larger not good enough? Then you need BIGGER! Your plants are like little athletes and should be fed and conditioned as such. You can follow our recommended dosing and get great results with Bloom FX. However, for our pioneers pushing the limits, we recommend increasing the dosage each feeding, while maintaining a close watch on your garden to ensure healthy uptake. It is always recommended to drain and replace nutrient solutions every week. This will ensure clean crops and optimal nutrient uptake. Use a PPM or EC meter to track your dosage and plants performance. Denser: Whether running the advanced program, Bloom FX is applied starting at 15ml per gallon and is increased each week of flower by 5 mls per week up to 30 mls at finish. In order to create thicker blooms, this booster must be applied consistently over the course of four weeks. A strong and abundant root zone is vital for the success of converting these fundamental elements into fruit and flowers for your plant. Bloom FX works best when applied in combination with Bloom and Micro Nutrients, Amino Blast, and Bloom Spray. This will help your plants achieve peak density. Side by side testing of Bloom FX against some of the more well known bloom enhancers on the market has proven that you do not need to spend top dollar to get top shelf results. The increased growth you will achieve in your garden is a direct result of starting with the high quality ingredients found in Bloom FX. Don’t just take our word for it. Visit our Facebook page (www.facebook.com/hydroponix) and read and see the many reviews and pictures posted by gardeners like you. These positive comments regarding Bloom FX and the full line of X Nutrients are overwhelming. Many customers are recommending Bloom FX to others, showing how satisfied they are with the performance of this wonderful and affordable bloom booster. The best things about Bloom FX are the quality and price. We are proud to help gardeners achieve larger, thicker, denser blooms, all while saving money. In addition to performance and affordability, there is one more reason so many growers are becoming fond of Bloom FX…high end results. It is user friendly, made with quality ingredients, and priced to sell. There are many people who have seen the results for themselves, and continue to spread the word. Use Bloom FX and start enjoying larger, thicker, denser blooms today!